a new method of producing orange paint resulted in a darker shade, almost red. the House of Orange became less popular. The colours were however never laid down officially, so in the 1930s the question of red versus orange was raised again, especially by the national socialist NSB party, who used the orange version. On 19 February 1937 Queen Wilhelmina decided by Order in council that: "The colours of the flag of the Kingdom of the Netherlands are red, white and blue." In 1958 the colours were defined more precisely as bright vermilion and cobalt blue. The prinsvlag formed the basis of the South African flag in use until 1994. Can you please precisely identify this Dutch flag for me? 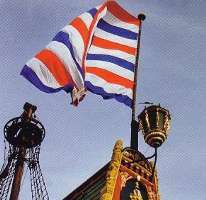 There is also a more colourful version flown by the Dutch ship Batavia (replica of the 17th century 'retourship') when she visited Sydney for the Olympic Games in 2000.Was this the flag of the VOC (Dutch East India Company)? This is a so-called "triple Princeflag". "Princeflag" is the early name for the Dutch tricolour (either orange-white-blue or red-white-blue). 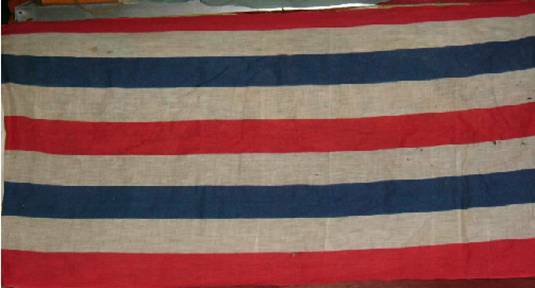 It was not uncommon to have the stripes twice (double Princeflag) or even three times (triple Princeflag). And sometimes an extra white stripe was added blue and red. The Double Princevlag with one white stripe added. arrived at the Cape in 1652, where she was wearing a double Dutch tricolour at the mizzen top, but that of course had only six bars red-white-blue-red-white-blue. staff correct. From this I assume he did his research properly. Might this mystery flag be a variant? The Truple Princevlag with two white stripes added.